Blog traffic has doubled over the last three days as 'panic reading' takes hold of the market. Such spikes in readership have in the past acted as good points for a near-term bottom, although today's action does not suggest as such. 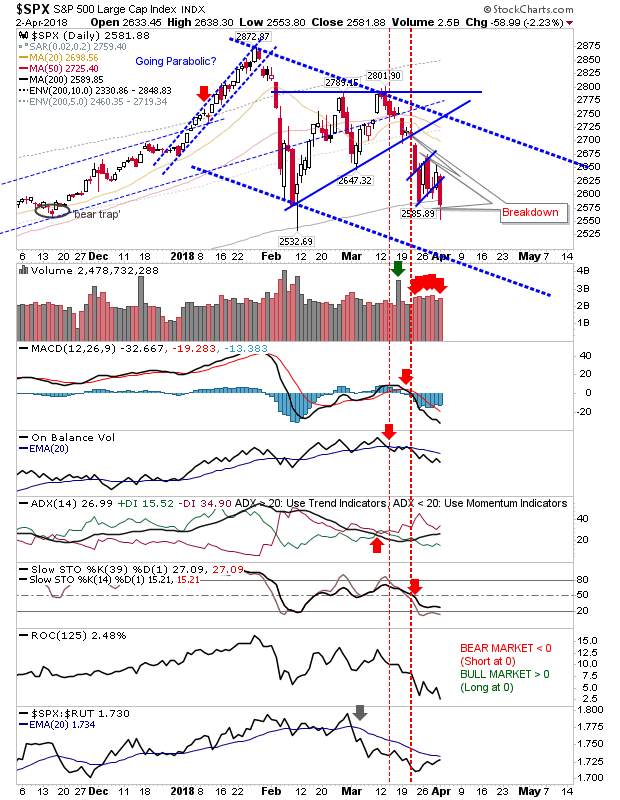 The S&P and Dow Jones both offered breakdowns from their respective 'bear flags'. 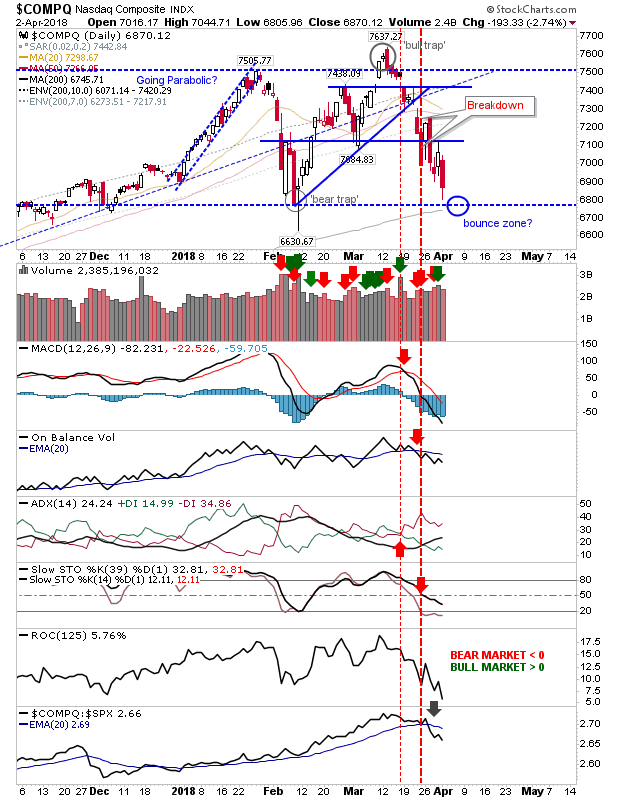 The S&P broke from the 'bear flag' and closed just below its 200-day MA. Volume climbed in distribution although there is enough to suggest this could be a support level. 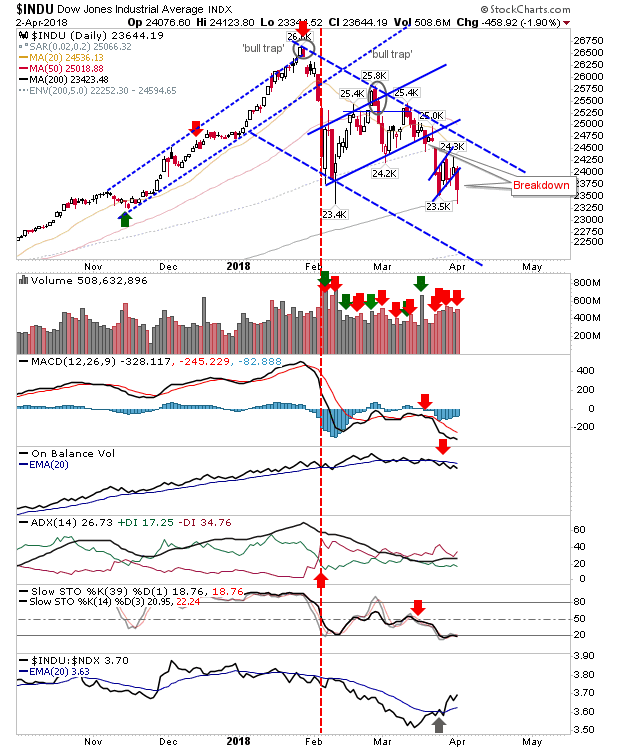 The Dow Jones Industrial average did break its 'bear flag' but didn't lose its 200-day MA. With the sharp uptick in relative performance (against Tech averages) there is a chance today's tag of the 200-day MA will act as a launch point of a rally. Tomorrow could offer a 'hammer' or 'doji' spike low which moves below - but finishes above - its 200-day MA. Stochastics are oversold enough for a bounce to emerge. The Nasdaq gave up close to 3% but didn't tag its 200-day MA. I still like the 200-day MA as a bounce zone but it could still be a few days before it's tested; stochastics are still a long way from oversold. 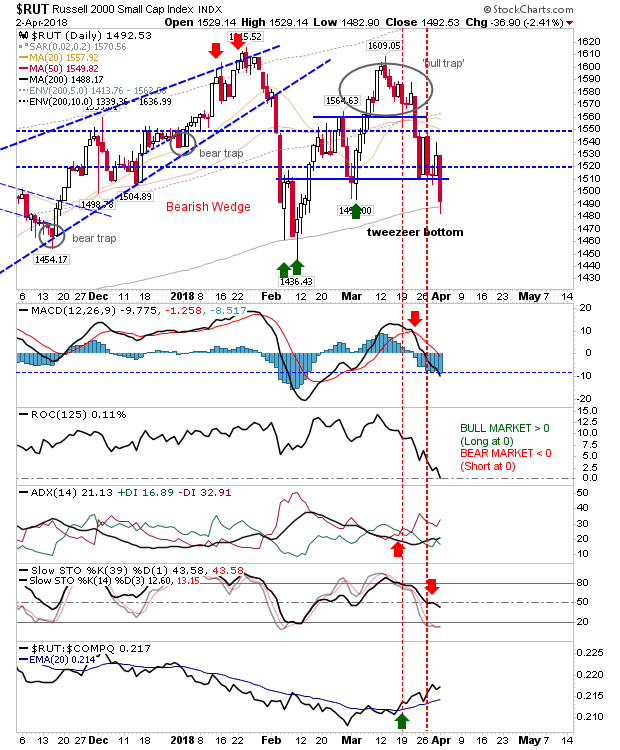 Relative performance is falling sharply which will make calling a bounce more difficult. The Russell 2000 did tag its 200-day MA as it undercut the 'tweezer bottom'. The opportunity for a bounce off the bullish stochastic 'mid-line' weakened with today's dip below this mid-line. The silver lining is the relative performance of the index which continues to gain; for the next rally, look for leadership from Small Caps but it might be a tough sell, to begin with. For tomorrow, for indices near 200-day MAs it will be important for them to close at or above this key average - but intraday moves below this moving average can and should be expected.